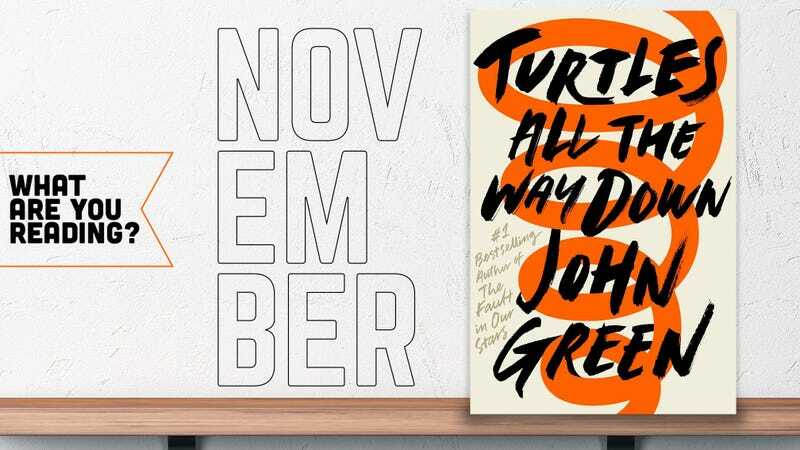 Turtles All The Way Down, the latest from YA author John Green, arrived in October with the now-customary fanfare. One of Green’s greatest talents lies in writing teenage characters the way that teenagers see themselves: We’re all smart, witty, and deeply self-conscious when we’re 16, whether or not the adults around us see it that way. Green’s earlier books largely told stories of smart, perhaps idiosyncratic teenagers, and the ways in which our teenage years are both fucked-up and wonderful. And although Green has always been open about mental illness in his work and his online life, this is the first book in which he’s effectively foregrounded it, making it a main character that drives the narrative and often tangles it, as mental illness has a way of doing. Sixteen-year-old Aza has obsessive-compulsive disorder (as does Green), and her brain is a never-ending spiral of intrusive thoughts and exceedingly specific obsessions. The plot ostensibly follows the disappearance of a nearby millionaire and Aza’s attempt to solve the mystery, but it’s all in service of Aza’s OCD and how it challenges her relationships—with her mom, her best friend, her potential boyfriend, herself. Green treats OCD and anxiety responsibly—he writes about therapy sessions and challenges with medication—without dragging it into an extended PSA, and if the characters are more forgettable than in his previous books, the psychological and emotional impacts will rattle around in your head for a while. It’s a book I wish I’d had as a teenager, one that’s both matter-of-fact about mental illness but also understands the ways in which it can capture and hold your brain hostage. Green’s portrait of OCD is beautiful and empathetic, even as Aza’s situation unspools—and it’s that backbone of empathy that ultimately allows the reader and the characters a way out of the downward spiral of her mind. Given how heroic a place history has afforded him, it’s fascinating to read how deeply despised Ali was for refusing to fight in Vietnam at the time. Eig reprints letters filled with bile from parents of soldiers, and he recounts how, at the time, Ali was frequently booed at his matches. People hated him for the things that he’s now widely loved for: his ego and his politics. It’s strange to see how recent history can change so resolutely. (It doesn’t hurt that he was both entertaining and right, as it turns out.) Eig teases out all the contradictions, though: Ali was a devout Muslim who had more extramarital affairs than he did professional boxing bouts, and many of those with the full knowledge (though not approval) of his wives. He also brings Ali’s desperate need for attention into full relief: He never took the service entrance in or out of a building, Eig claims, and he’d tell his limo driver to park it on the busiest block, so that he’d be sure to be swarmed by fans wherever he went. It’s not all glory days, either: Eig takes the title of his book seriously, documenting the sad final days of Ali’s career and everything that came after, including his Parkinson’s disease. It’s a great, long look at a figure who, though flawed, is still worth learning about and learning from—maybe now more than ever. A relationship advice book published after a very public split—that kind of snafu is very much in keeping with Anna Faris’ life. The Scary Movie-star-turned-sitcom-lead-turned-author wrote this literary spin-off of her podcast, Anna Faris Is Unqualified, while she was still (mostly) happily married to Chris Pratt. She even asked him to contribute the foreword, which he did, but only after they went public with the news of their impending divorce. Their real-life circumstances intrude upon the book, which is full of passages about how badly Faris wanted to get together with Pratt on the set of Take Me Home Tonight, and all the romantic gestures Pratt made during their nine-year marriage. Knowing the outcome makes this a bittersweet read, but no less honest or funny. And for all the self-deprecation in the title of her podcast and book, Faris is not only a great host, but a solid writer.